The Fellowship was fortunate enough to obtain a copy of PALMIOTTI & BRADY’S THE BIG CON JOB #1 from BOOM! Studios. 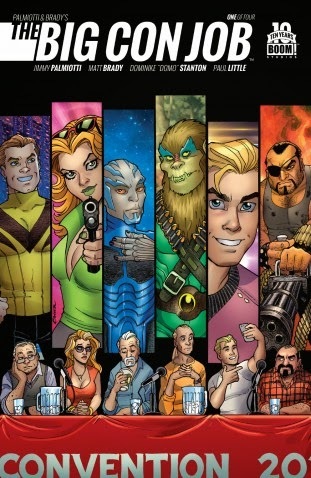 Jimmy Palmiotti and Matt Brady write, Dominike “Domo” Stanton draws and Paul Little colors. Poach, Blaze, Hendrix and Colin have been working the con circuit for years, basically living off of past glories. Barely eking out a living, and certainly not earning enough to retire. But when their old friend (and fellow con guy) Danny does something drastic (no spoilers), the gang starts to get restless. Then they meet Tony King, an agent with a crazy plan, one that the gang just can’t refuse. Good stories are about people. And what makes this a good story is the people. This issue is all about introducing us to the characters and making them real to us. Danny’s depression, Poach’s wit, Blaze’s violent streak. We feel with them, and that makes us care about them. Oh, and the outrageous premise – that helps, too. The art also focuses on the people, with simple long shots and great closeups. If story’s your thing, get this book. And if nothing else, the cliffhanger it drops on you will make you come back for issue 2. Seriously. PALMIOTTI & BRADY’S THE BIG CON JOB #1 is available now at your FLCS or at boom-studios.com.